ALERT: Derivative BIG Bank Collapse? SHOCKING PROOF OF VOTER FRAUD! HILLARY GETS BOOED AT HER OWN DNC CONVENTION! This is not meant, however, to sound defeatist. Of course, US militarism and its war-mongering imperialist foreign policy could be overturned. American hegemony is not divinely ordained. But such a radical, fundamental change in direction will require a massive popular movement among ordinary Americans. It will not be achieved on the basis of one fiery politician’s words. After today's uneventful Fed announcement, all eyes turn to the BOJ where many anticipate some form of "helicopter money" is about to be unveiled in Japan by the world's most experimental central bank. However, as Nomura's Richard Koo warns, central banks may get much more than they bargained for, because helicopter money "probably marks the end of the road for believers in the omnipotence of monetary policy who have continued to press for further accommodation in the midst of a balance sheet recession, when such policies simply cannot work." As he continues, believers "have doggedly insisted that it is possible to control inflation because (1) inflation is everywhere and always a monetary phenomenon and (2) central banks control the supply of money. Based on this belief, they have implemented a variety of policies including quantitative easing, negative interest rates, forward guidance, and inflation targeting, each of which has failed to produce expected results. Now they have reached the end of the line, and the signpost reads "Last stop: helicopter money." Koo continues to unload on central bankers, slamming their "faith that the economy will pick up if only money is dropped from the sky" that has provided a psychological foundation for economists and policymakers convinced of the efficacy of monetary policy. It also explains why nothing has worked yet. The Nomura strategist then mocks "their belief that dropping money from helicopters would revive the economy that has led them to assume that slightly less extreme policies such as quantitative easing and inflation targeting would also have a positive economic impact (albeit a more modest one)." This is precisely what we said in March 2009 when the Fed first launched QE, and were mocked. It has now become mainstream. We also predicted that the endgame will ultimately be hyperinflation, after an extended period of intermediary steps in which central bankers stumble from one interim, and flawed, "solution" to another, until they finally hit the monetary endgame... which is where we are now. Eventually the private sector will complete its balance sheet repairs and resume borrowing. When that happens, inflation can quickly spiral out of control unless the central bank drains the liquidity it pumped into the market under quantitative easing or helicopter money. For example, excess reserves created by the Fed currently amount to some 15 times the level of statutory reserves. That implies that if businesses and households were to resume borrowing in earnest, the US money supply could balloon to 15 times its current size, sending inflation as high as 1,500%. The corresponding ratios are 28 times for Japan and Switzerland, five times for the eurozone, and 11 times for the UK. Once private-sector demand for loans recovers in these countries, confidence in the dollar, euro, and yen will plummet unless the Fed reduces excess reserves to one-fifteenth of their current level, the ECB to one-fifth, and the Bank of Japan to one-twenty-eighth. So what's the problem: just soak up reserves, i.e., sell central bank assets? However, as Koo puts it, "that sort of extreme reduction in reserves will require the central bank to sell the bonds it holds, which would be a nightmare for both the economy and the bond market." In short, it would result in a bidless (already illiquid) bond market with yields exploding, and likewise trigger an explosion in inflation as suddenly interest rates go through the roof, countless companies default on their debt, and the value of both debt and credit implode. A look at the helicopter money debate in Japan and elsewhere shows that the actual policies being discussed can be classified into four main types. The first is helicopter money in the literal sense of dropping money from helicopters. Would this work? In Japan, at least, it would be another complete failure. This is because when the typical Japanese finds a 10,000-yen note lying on the ground, she will turn it in at the nearest police station rather than spend it. Put differently, a helicopter money policy can only work if the people in a country have little sense of right and wrong. Another critical omission from the argument that helicopter money will resuscitate the economy is that it focuses exclusively on the logic of buyers while ignoring the logic of sellers. Unethical buyers may try to go shopping with money that has fallen from the sky, but there is no reason for sellers to accept such money. Sellers are willing to take money in exchange for goods and services only because the supply of that money is strictly controlled by the central bank. If money starts falling from the sky, sellers will refuse to accept it as payment for their products. If the authorities actually began dropping money from helicopters, shops would either close their doors or demand payment in foreign currency or gold, and the economy would quickly collapse. There is no economy so wretched as one that no longer has a national currency the people trust. In light of the above, the argument that monetary policy can be relied upon to boost the economy because helicopter money is the ultimate form of monetary accommodation and always works can be seen to be complete nonsense that ignores the standpoint of sellers. Taking monetary accommodation to those extremes would lead to the economy's collapse, not its recovery. There is no case in recorded history of an economy without a credible national currency outperforming an economy that has one. In response to this criticism, some proponents of helicopter money would probably say that the helicopter money policies now being discussed do not involve actually dropping money from the sky but rather call for direct financing of government fiscal expenditures by the central bank. In this, the second version of helicopter money, the money is supplied in a way that is not immediately visible to ordinary citizens, so it may take time before sellers begin refusing to sell, but the problems that remain are no different from those of quantitative easing. Fiscal stimulus itself can provide a large boost to the economy. But while direct financing by the central bank may increase reserves in the banking system, those reserves will be trapped in the banking system because there are no private-sector borrowers during a balance sheet recession even at zero interest rates. Prime examples include post-1990 Japan and the leading Western economies since 2008. At such times, the "direct" part of the direct financing of fiscal stimulus cannot stimulate the economy or raise inflation any more than the "non-direct" QE. Both growth and inflation have remained at depressed levels in Japan (since 1990) and the West (since 2008) regardless of how accommodative monetary policy has become because the private sector stopped borrowing after the bubble collapse slashed the value of its assets but left its liabilities intact. But that sort of extreme reduction in reserves will require the central bank to sell the bonds it holds, which would be a nightmare for both the economy and the bond market. It would be a different matter if we were talking about future increases in reserves under a helicopter money policy, but the Fed has already created some $2.5trn in excess reserves under quantitative easing, and the BOJ has created ¥250trn, which means the monetary authorities cannot avoid the issue of draining those funds from the market. A third version of helicopter money involves government money printing or the replacement of the JGBs held by the BOJ with perpetual zero-coupon bonds. The people proposing these policies hope that fiscal stimulus financed by government scrip or perpetual zero-coupon bonds, which are not viewed as government liabilities, will elicit spending from people who are currently saving because of concerns about the size of the fiscal deficit and the likelihood of future tax increases. Economists refer to this reluctance to spend because of worries about future tax hikes as the Ricardian equivalence. If true, it implies that consumption will increase each time the government raises taxes since higher taxes mean lower deficit in the future. The fact that this phenomenon has never once been observed in the real world suggests it is nothing more than an empty theory. Moreover, there are serious issues that must be confronted once the economy picks up and the liquidity supplied by the monetary authorities via government scrip or zero-coupon perpetuals must be drained from the system. Perpetual zero-coupon bonds are essentially worthless, which means the BOJ cannot sell them—no one in the private sector would be stupid enough to buy them. That means the only way to mop up the excess reserves created via the issue of perpetual zero-coupon bonds is for the BOJ to ask the MOF to issue equivalent amounts of coupon-bearing bonds. The same would be true when trying to mop up reserves created by government scrip. Once this scrip starts circulating, it becomes part of the monetary base, and draining it from the system will require the government to absorb it by issuing bonds. And in the case of both perpetuals and government scrip, the government that issued the bonds cannot spend the proceeds. If the government spends them, the liquidity that had been mopped up will flow back into the economy again. Those recommending the issuance of government scrip or perpetual zero-coupon bonds say that one advantage of this approach is that it does not lead to an expansion of government liabilities (upon issuance). However, they will become massive government liabilities when the economy eventually recovers and they must be mopped up. In other words, the biggest issue with helicopter money—as with quantitative easing—is the question of how to drain these funds from the system. It becomes clear just how problematic both policies are when the difficulty of draining reserves is taken into account. Yet in all the discussion about helicopter money and quantitative easing in Japan and elsewhere, almost no one has touched on the massive costs involved in mopping up the excess reserves created under these policies. Everyone emphasizes the benefits of these policies when introduced while ignoring that those benefits are small indeed when we examine the costs and benefits over the policy's lifetime. As one example of this bias, Waseda University professor Masazumi Wakatabe argued in a Nikkei column titled "Easy Economics" that helicopter money is preferable to quantitative easing inasmuch as it enables the government to undertake fiscal stimulus without increasing its liabilities. I suspect that the helicopter money envisioned by Mr. Wakatabe involves the issuance of government scrip or direct central bank underwriting of perpetual zero-coupon bonds. However, he makes no mention whatsoever of how the liquidity created via these methods will be drained from the system once private-sector demand for loans recovers. As described above, the only way to mop up liquidity that has been created using these methods is for the government to issue bonds and not spend the proceeds. I think this would be more difficult from both a legal and practical perspective than winding down quantitative easing, which in itself is no easy task. Moreover, the amount of government debt that must ultimately be acquired by the private sector is no different from a case in which the government had issued bonds to fund fiscal stimulus from the outset. In short, whether fiscal stimulus is funded with government scrip and zero-coupon bonds or with the ordinary issue of government debt, the size of the government's liabilities will be the same in the end. Helicopter money offers no benefits whatsoever when viewed over the lifetime of the policy, including the eventual need to mop up liquidity. A fourth version of helicopter money involves handing out money directly to consumers, without requiring it to pass through financial institutions. In this scenario, a consumer might open her mailbox one morning to find an envelope from the Bank of Japan containing ¥1mn. While that discovery may bring momentary happiness, I suspect she may feel a chill down her spine once she realizes everyone around her had received similar envelopes. And if such envelopes arrived day after day, the entire country would quickly fall into a panic as people lose all sense of what their currency is worth. Regardless of what buyers might wish to do, sellers would be forced to protect themselves, with stores putting up signs requesting payment in either foreign currency or gold. This is a nightmare scenario. Why is helicopter money so popular? What I find fascinating is why so many pundits in Japan and elsewhere continue to promote policies like quantitative easing and helicopter money while completely ignoring the need to eventually mop up all the liquidity created under these policies. One possibility is that this marks the last stand of the academic economists who have been insisting for the past three decades that monetary policy is the solution to all economic problems. Mr. Wakatabe, for example, declared without irony that "the problem of how to increase nominal GDP always has an answer: helicopter money." This argument completely ignores sellers' reactions and the ultimate cost of mopping up excess liquidity. Yet even Mr. Wakatabe acknowledged in the aforementioned Nikkei column that no matter how much money the central bank supplies under quantitative easing, "the money available for people to use will not increase unless financial institutions start lending more." This statement suggests that the professor has finally realized the shortcomings of monetary policy during a balance sheet recession, something we have been talking about for the last 20 years. And that, in turn, may be why these economists are now leaning in the direction of helicopter money, which could go directly to the households and not depend on financial institutions. Will private-sector loan demand ever recover? Another possibility is that these economists are assuming private-sector loan demand will never recover. If that were in fact the case, there would be no need to mop up the liquidity, and consequently no need to worry about the attendant costs. The current economic slump could continue indefinitely if people who had terrible experiences digging themselves out of debt following the asset bubble's collapse decided they would never again borrow money. In that case there would be no need for the central bank to move quickly to mop up the funds created under quantitative easing and helicopter money. It is extremely difficult to project when the private sector will overcome its debt trauma and resume borrowing, inasmuch as there are few historical instances in which an economy has emerged from a balance sheet recession. But I think it is dangerous to keep quantitative easing and helicopter money policies in place based on the assumption that the current situation will continue forever. After all, success for all policies including helicopter money is defined as a recovery in private-sector demand for loans. This post Experts: "Peak Gold" Has Arrived appeared first on Daily Reckoning. Will there be enough gold to match exploding demand? The crackerjack analysts at Sprott Asset Management say global gold discoveries peaked in the mid-1990s. And gold production hit a new all-time record in 2015 — for the seventh consecutive year. But Sprott says 2015 could go down as the year global gold production maxed. But all that gold production over the past 20 years has left the cupboards bare. Gold producers just haven't found the big deposits in recent years, even though Sprott says exploration budgets increased 250% between 2009 and 2012. According to Pierre Lassonde, chairman of the gold royalty and streaming company Franco Nevada, the number of "super-giant" discoveries (more than 20 million ounces) has plunged in recent years. In the 1980s, he says, 14 super-giant deposits were located. Eleven were found in the 1990s. But only two have been discovered in the past eight years. And none in the past five. Lassonde also says the quality of most recent gold discoveries is second- and third-rate. Ore grades averaged 12 grams per ton in the 1950s. Now they're only about 3 grams per ton. And he says many gold finds are only yielding one lonesome gram per ton. Never before has so much time and money been spent… by so many producers… to fetch so little gold. Jim Rickards has a contact deep within the gold market. He can't identify him for security reasons, so he refers to him as "Goldfinger." When Jim met with him in Zurich recently, this fellow says gold shortages are already showing up in the Swiss gold refineries. They're struggling to find fresh supplies from the mines. Back to Lassonde. He thinks one thing can save the gold mining industry from the "production cliff": New technology. Fracking saved the oil and gas industry. He thinks it could one day transform the gold industry. But will it? And when? It's crickets so far. In the meantime, major gold producers are using the one card up their sleeve: buyouts of junior miners with proven deposits. That saves the biggies all the time and hassle of hunting for gold themselves. Just buy out the small fry. Byron King, senior geologist at our own Rickards' Gold Speculator: "Launching new mining projects — exploration, development and production — requires a lot of time, money and energy. That's why large miners' management teams are increasingly looking at small, turnkey projects that they can acquire and then scale." That's also why Sprott says there will likely be a "significant wave of mergers and acquisitions (M&A) within the gold industry," as reported by MarketWatch. But none of that avoids the looming "gold production cliff." It just puts existing gold projects into stronger hands. Again, where will the new gold come from to meet the demand? These M&As can sure do wonders for select gold stocks in the meantime, though — share prices often trade at multiples to the price of gold itself. And buyout targets can see their stock prices double, triple, practically overnight, once a deal's announced. Below, Rickards' Gold Speculator senior geologist, Byron King, shows you one site that could become a literal and proverbial gold mine for investors in the years ahead. Read on. The post Experts: "Peak Gold" Has Arrived appeared first on Daily Reckoning. This post Finding Gold in a World of Increasing Scarcity appeared first on Daily Reckoning. Our mission at Rickards' Gold Speculator is to identify precious metal plays with significant share price upside. The upside could come from either normal appreciation over time, or due to quick pops via takeover. An example of a quick pop via takeover is Kaminak Gold. In May, our subscribers enjoyed a 37% gain in less than a week. We recommended Kaminak Gold in our Gold Speculator kickoff portfolio on May 9. A few days later, we learned of a $520 million deal (Canadian dollars) for mining giant Goldcorp to take over Kaminak. Kaminak shares rose sharply in price, and we recommended selling into strength. In order for us to find the best possible takeover targets, it's beneficial to learn exactly what large mining companies like Goldcorp want to see in a takeover play. Wouldn't it be great if they would just tell us? Across the world, gold discovery peaked in the 1990s. It's basic logic that you can't produce what you have not discovered. 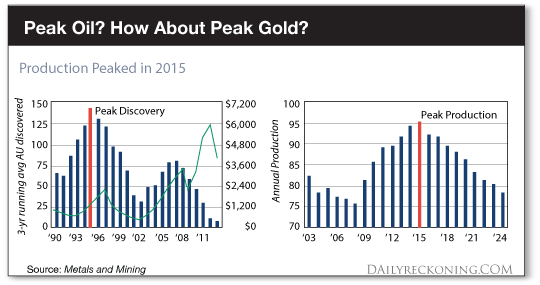 As gold discoveries decline, so will production over time. Add the fact that Goldcorp management calculates that gold production peaked in 2015 and trends are all downhill from here. Let me illustrate with this data shot. It's from a recent Goldcorp presentation. According to Goldcorp's slide, there are "significant supply constraints ahead." If Goldcorp wants to remain a major producer, it must grow reserves and invest in new production. Meanwhile, according to one Goldcorp rep last week, "It takes about 20 years to move a project from discovery to initial production. We have to get ahead of that curve." Goldcorp's preferred method to stay in the gold game is through what the company calls "brownfield" exploration and expansion. This means that Goldcorp focuses future growth in existing mine districts that host established discoveries and/or developments and production. Along the way, Goldcorp will seek partnerships with junior companies that are active in these kinds of areas to cultivate a future production pipeline. Right away, one can understand why Goldcorp was interested in Kaminak. The Coffee project is well along in terms of identifying a serious resource and obtaining permits to build. Plus, it's right in the heart of the storied Yukon, with a mining history of over a century. Coffee sits atop a significant and underexplored — mineralized belt that extends from central Alaska through Yukon territory. Coffee acreage abuts the Yukon River, which more or less follows the line of a deep-seated rip through the earth's crust, called the Denali Fault — a San Andreas-sized feature. There's significant other faulting in the Coffee area as well, beyond what one sees with the Denali Fault. These other faults appear to be the source of most mineralization. All in all, Coffee is a geologically superb, very large mineralized zone. Kaminak initially discovered gold at Coffee in 2010. Since then, Kaminak drilled hundreds of holes to identify 16 other distinct gold discoveries, and established a probable reserve of 2.1 million ounces of gold. It's reasonable to believe that there's likely much resource yet to be identified. Still, in terms of finding and proving-up a resource, Kaminak accomplished what it set out to do. Looking ahead, Kaminak – with Goldcorp now in control — has more work to do to complete mine permitting; thus the work effort isn't entirely complete. Right now, the forecast is that mine construction cannot begin before 2018. Eventually though, Kaminak's proposed mine will have an initial 10-year life. It should deliver average annual gold production in excess of 200,000 ounces for the first five years, and overall average annual life-of-mine gold production of 184,000 ounces. Let's return specifically to why Goldcorp chose to buy out Kaminak, versus some other play somewhere else. As I mentioned above, I was there at Coffee for a unique opportunity to visit the site. I decided to ask about what are Goldcorp's criteria are for takeover targets, specifically Kaminak. Frankly, I wasn't sure how open the Goldcorp reps would be. Some information is proprietary, and I understand that. Still, I was able to glean quite a bit of information. Here's what Goldcorp reps mentioned during discussions and/or what was apparent to me during my site visit. Goldcorp likes Yukon territory because it's a well-regarded, safe jurisdiction. The legal regime is secure. Rule of law prevails. The government is willing to work with mining firms. Apparently, Goldcorp is wary of political developments and unfavorable trends in many other places. Thus, Goldcorp is looking for great deposits in locales with low political risk, like Yukon. In addition, Yukon has an astonishingly good approach to industry working with First Nation people. In recent years, Yukon has been a place where projects get permitted and the work gets done. It's all very businesslike. I cannot emphasize this last part too much. The First Nation relationships are entirely respectful and professional, and to the extent they work well, they're admirable. They're a model for others to emulate across Canada, and in other parts of the world. Between Yukon's government and its First Nation environment, I don't believe that Goldcorp's move for Kaminak is just some sort of flash in the pan or passing investment fad. This is not a case of "Yukon Fever," as one ill-informed wag mentioned in a note to me. Not at all; Yukon offers a fabulous treasure trove of mineralization. It lays out a welcome mat for companies that want to approach things in a serious, professional, developmental mindset. Indeed, the gold ounces are present at Coffee and that's what Goldcorp seeks; it is a mining company after all. But more important, from what I saw, is the overall quality of Kaminak's personnel. They discovered those ounces and are entirely conversant with the details of everything. My impression was that Kaminak staff are collectively superb. While on site, I learned that Goldcorp has retained almost all Kaminak technical staff, and it's no wonder. The Kaminak people are extremely good at their respective jobs. I met several geologists and technical staff, all of whom are sharp as tacks and totally committed to making Coffee work as a future gold mine. To sum up, my takeaway from Coffee was that Goldcorp bought Kaminak for the gold resource (naturally), the jurisdiction, the overall low-risk profile, the "doability" of the project within reasonable time and technical and professional excellence up and down the line. My takeaway impression I got from my visit is that Goldcorp uses an analytical process similar to our M.I.D.A.S. system here in Rickards' Gold Speculator. Guess what: It works! My partner Jim Rickards has said over and over that gold is heading to $10,000 an ounce. Given surging gold demand around the world and declining production in the years ahead, he could very well be right. The post Finding Gold in a World of Increasing Scarcity appeared first on Daily Reckoning. Over time, charts for a bull market tend to print higher highs and higher lows on the way to the primary top. Two steps forward, one step back, creating a visual stair-step effect. This chart "picture" has been in evidence for gold, silver, and the miners since January. Although gold dust is precious, when it gets in your eyes it obstructs your vision. Hsi-Tang Economists stated that main trigger for the financial crisis of 2008 was the issuance of mortgages that did not require down payments. The ease at which one could get mortgages in the past is what drove housing prices to unsustainable levels. Post-crisis all banks vowed to end the practice forever, or that is what they wanted everyone to believe. When the credit markets froze, we openly stated that the 1st sign that banks were getting ready to lower the bar again would come in the form of Zero percent balance transfer offers that had all but vanished after 2008. A few years after 2008, banks started to mail these offers out, and now everywhere you look you can find 0 % balance transfer offers ranging from 12 months to 18 months. The next step after that would be for banks to lower the 20% down payment required to something much lower. Currently, Bank of America and a few other banks are offering 3% down mortgages. Mining Weekly this week quotes DRD Gold CEO Niel Pretorius as recognizing a growing problem with "paper gold," with the supply expanding while gold production declines. "There's a shortage of real gold to cover the paper gold position that's out there," Pretorius says. Of course there's no guarantee that investors will not continue to prefer "paper gold" over real metal, thereby allowing central banks to inflate the supply of the former and in effect lock the exits from their fiat currency system. But it's nice to see a gold mining executive willing to acknowledge what's really going on. -- is just two months from resuming production and is enjoying a rising share price. The lesson seems to be that the Barrick people are much better geologists than business strategists. This post The Greatest Medical Discovery of All Time appeared first on Daily Reckoning. Can you guess what I think is one of the greatest medical discoveries of all time? I'll give you a few hints. In the late 1700s, English physician and scientist Edward Jenner discovered a way to train the immune system against smallpox infection. He used material from a similar animal infection, called cowpox. To this day, the practice of creating an adaptive immunity comes from the Latin word for cow: vacca. Of course, I'm talking about vaccines. We've taken the idea behind vaccines much further over the past couple of centuries. We now have vaccines against many different viruses. However, there are still shortcomings to common vaccine tech…there are many types of viral infections we haven't been able to eradicate. In some cases, the viruses mutate too fast. A vaccine is obsolete by the time it becomes available…and producing new vaccines takes time. In other cases, we just haven't figured out how to build a working vaccine in the first place. The problem is that to a large extent, we are using technology that's about a century old. Newer technology has enabled us to develop new vaccines for viruses such as hepatitis B and HPV. But many deadly pathogens remain. One such disease we just haven't been able to tackle is a virus called respiratory syncytial virus, or RSV. RSV is a very common respiratory system infection. Most of the population has been infected by their second birthday. It's a common cause of pneumonia. And it makes a pretty hefty footprint in our health care system. According to the Centers for Disease Control and Prevention, it causes nearly 60,000 hospitalizations and 2.1 million outpatient visits for kids under 5. This disease strikes our older population too. Among those over 65, it causes 177,000 hospitalizations per year… and 14,000 deaths. That's just here in the United States. Despite our best efforts, to date we haven't been able to create a satisfactory RSV vaccine using traditional technology. We could protect our older people from being killed by this virus. Infants could also receive immunity from their mothers… provided they are vaccinated. One of the greatest-ever improvements in human health has been thanks to the deployment of vaccines that helped eradicate viral infections like smallpox and polio. But as you can see with ailments like RSV, there are still a lot of viruses that take our lives. I predict we will begin to see a new generation of vax tech that is going to help continue our success against the microscopic killers. In fact, I've identified a company in my Agora Financial's FDA Trader portfolio that I think will eradicate some of the more complex diseases – including RSV. Whoever can solve these problems is on the road to making big profits. The post The Greatest Medical Discovery of All Time appeared first on Daily Reckoning. The post Corrupt Or Just Stupid? Markets Hand Corporations An Unlimited Credit Card appeared first on DollarCollapse.com. Barrick Gold Corp, the world's largest gold producer, is weighing a sale of its majority stake in African unit Acacia Mining and has approached several South African miners, according to sources familiar with the situation. The potential sale would be part of Barrick's broader strategy of selling non-core assets to reduce its debt load. The Toronto-based company offloaded stakes in several mines last year. The talks are at an early stage and there is no assurance a deal will be done, the sources said. Many investors and their financial advisors consider gold to be a commodity, which makes gold no different than copper, timber, pork bellies or orange juice. They do not understand, or simply are unaware, that gold has been successfully used as money for over 3,000 years. Although some people think it is an archaic relic, the facts don’t support this view. So, what is money? Gold is traded on the currency desks of all major banks and brokerages, along with dollars, euros, yen and pounds, and not the commodity desks along with other commodities – the FX traders know gold is money. The worst part of the world's ongoing financial crisis is still on the way: A crisis that has its roots in the debt-based monetary system. The debt-based monetary system has facilitated the growth of debt, to levels that will inevitably bring total collapse. Everyday we see more and more events (think Greece, Deutsche Bank, etc.) that suggest that the total collapse is very close. The number of these will increase over the coming months, while their extent will also greatly magnify.